Vashti's next move was to turn off the isolation switch, and all the accumulations of the last three minutes burst upon her. The room was filled with the noise of bells, and speaking-tubes. What was the new food like? Could she recommend it? Has she had any ideas lately? Might one tell her one's own ideas? Would she make an engagement to visit the public nurseries at an early date? - say this day month. I suppose this is the part one might find "prophetic" in this story - this pattern of (incessant) communication that mirrors the one created by today's social media. Fair enough. What is more interesting, though, is the role ideas play in this scheme. Reality is not important, one’s ideas about it (constantly broadcasted to the world) are. Anything outside the inner world, sustained by the quiet, efficient way in which the Machine meets everyone’s physical needs, is simply not interesting. The Machine does not need to forbid people from leaving their cells: they have little interest in it and, besides, they lost the ability to breathe the outside air unaided. 'No ideas here,' murmured Vashti, and hid the Caucasus behind a metal blind. In the evening she looked again. They were crossing a golden sea, in which lay many small islands and one peninsula. She repeated, 'No ideas here,' and hid Greece behind a metal blind. In a way, technology and this primacy of ideas over sensations are twin dangers, because they separate people from the world. 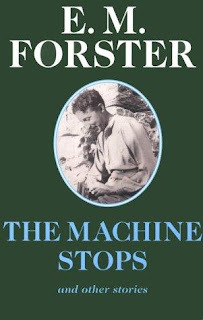 (I do wonder if this is the modernist in Forster talking.) 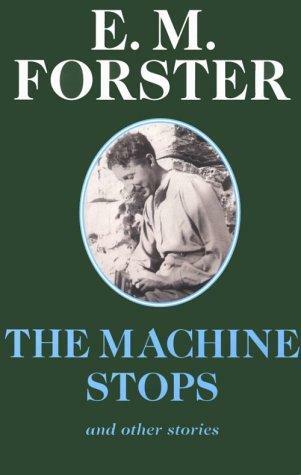 In any case, for Forster something is definitely lost in this communication mediated by technology. As Kino, the one character who craves the real deal and eventually finds a way to briefly escape to the surface, says: "I see something like you in this plate, but I do not see you. I hear something like you through this telephone, but I do not hear you." This is maybe a bit naive. There is no guarantee that there is something inherently different (let alone better) about "humanity naked" that is altered by technology. Still, there is something moving about the account of Kino's struggle to get to the surface. It's perhaps the mere idea of resistance, of breaking free in general. The fact that the Machine turns oppressive in response to this act of rebellion only validates the struggle. It was easy at first. The mortar had somehow rotted, and I soon pushed some more tiles in, and clambered after them into the darkness, and the spirits of the dead comforted me. I don't know what I mean by that. I just say what I felt. I felt, for the first time, that a protest had been lodged against corruption, and that even as the dead were comforting me, so I was comforting the unborn. I felt that humanity existed, and that it existed without clothes. How can I possibly explain this? It was naked, humanity seemed naked, and all these tubes and buttons and machineries neither came into the world with us, nor will they follow us out, nor do they matter supremely while we are here. Had I been strong, I would have torn off every garment I had, and gone out into the outer air unswaddled. But this is not for me, nor perhaps for my generation. I climbed with my respirator and my hygienic clothes and my dietetic tabloids! Better thus than not at all. I'm not going to spoil the ending for you. If you want to see what happens when the Machine stops, this story is available for free here, go forth and read it. It's not long and it's definitely a text worth engaging with. I read this at uni twice, at two different levels. Both times I found it to be really interesting, particularly when read alongside Howards End. I think it reflects and illuminates the Edwardian state of mind brilliantly. That's and it's a really good read!